Hydro-Action Aerobic Advantages - Septic Solutions Inc.
High Performace. 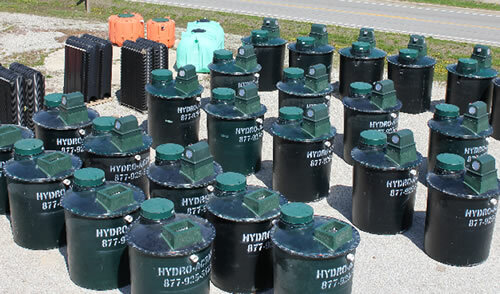 The Hydro-Action system outperforms traditional septic tanks in prolonging drain field life, meeting environment standards, and handling issues like poor soil or high groundwater. Easy Installation. Our system is easily installed without heavy equipment or major excavation. This also means the system can be installed in very small, tight areas giving you better ability to adapt to the layout of your property. Easy Maintenance. With no moving parts or components inside the tank, and instant access to all operational components mounted in the OPS housing, routine maintenance is quick and easy. Cost Effective Solution. With a simpler installation than conventional systems, high adaptability to difficult land conditions, and economical operating costs, Hydro-Action is a better system. Durability. Water-tested fiberglass design, manufactured by a U.S. industry leader with 30 years experience. Our tanks are even tougher and longer lasting than concrete tanks. Two Year Warranty. Your system will be inspected and serviced twice a year for the first two years. If any defects occure in the first two years our warranty will cover them.